When your personal freedom and mobility are on the line, you don’t want just any attorney - you want an attorney with the training, education and experience to help you resolve your case as quickly and effectively as possible. 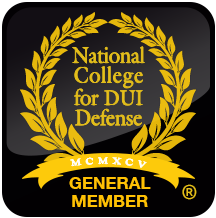 I am currently the only attorney in Sioux City, IA area who is a certified DWI Detection and Standardized Sobriety Testing Instructor. As a certified instructor, I can use my in-depth education and experience to evaluate the field sobriety tests administered by arresting officers, identify potential testing errors and bring those errors to light in your defense. I have attended many of the same training courses developed by the National Highway Traffic Safety Administrations (NHTSA) that police officers are required to complete, including: DWI Detection and Standardized Field Sobriety Testing; Advanced Roadside Impaired Driving Enforcement (ARIDE). I’ve also completed a 24 hour overview of the Drug Recognition Expert Course (DRE) so I am familiar with the training that officers receive to investigate drug related OWI/DUI cases. (see http://www.nhtsa.gov/). This extensive training allows me to have insights into the field sobriety testing area that most attorneys don’t have and therefore, can’t use on your behalf. This experience can be a major advantage in winning your case. Consequences for Sioux City OWI/DUI Convictions or Guilty Pleas Are Extremely Time Sensitive. When you are arrested and charged with an OWI in Iowa, your driving privilege may automatically be revoked by the Department of Transportation. You may be able to appeal the revocation of your license by filing a written request for appeal with the Department of Transportation but the appeal is extremely time sensitive. If you were given an OWI Implied Consent Form (Request and Notice under Iowa Code Chapter 321J/Section 321.208) you only have 10 days from the day you were given the form to file the appeal. Contact me as soon as possible so I can help you understand the appeal process and work with you to keep your license. If your license is revoked, despite the appeal, or because you missed the deadline, you will be subject to a minimum suspension of 180 days, but the revocation could last for up to 6 years if this is a third offense or an OWI charge the involved the death of another person. While a restricted license may be available in some cases, the length of the revocation and the availability of a restricted license depend on a number of factors including your age, the level of alcohol present in your tests, whether or not an accident happened and if you’ve been convicted or plead guilty to other OWI charges. While hiring an attorney to handle your case may not have been in your budget, a guilty plea or a conviction for an OWI/DUI is even more expensive and the impact is long lasting. Between Department of Transportation fees, court fines, alcohol or drug class costs and increased insurance costs, an OWI/DUI can easily cost several thousand dollars. I can help reduce that financial impact if you call me early enough in the process. Call the Goodman Law Firm today to learn about your choices, and how I can help you minimize the personal and financial impact of an OWI/DUI arrest or criminal charge. All consultations are confidential. You have nothing to lose but your fear and uncertainty and everything to gain.